Rather than following the recipe as written, I simply used the Indonesian sauce that flavors the dish. I prepared the sauce first and then fried the egg which was added later to the recipe. When it came to making the fried rice, I made it the way I've always made it for nearly 30 years. I guess it was just my natural instinct to make fried rice the best way I know how. But the sauce... was wonderful. It was perfectly balanced with sweet and salty flavors. I omitted the use of chiles because at the time, we weren't in the mood for anything spicy but you could certainly add 5 fresh green or red Thai chiles or use 2 serranos or 2 medium jalapenos. Heat 1 teaspoon of oil over medium high heat. Once hot, pour the whisked eggs into the pan and allow to set. Pull the cooked edges towards the middle and tilt the pan to allow the runny eggs to coat the bottom of the pan. Continue to do this as needed until no runny egg remain. Place onion and garlic in 12-inch nonstick skillet with oil. Sauté over medium heat, stirring constantly, until translucent. Crumble the cold, leftover rice into the middle of the skillet. 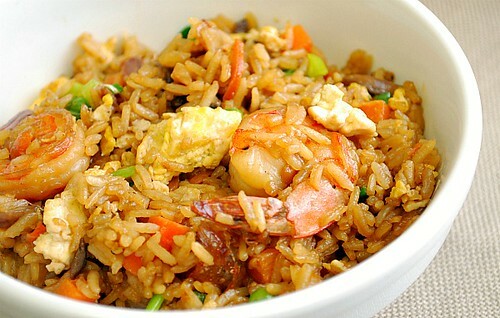 Cook the rice along with the shrimp until the rice is warmed through and slightly toasted, about 5-7 minutes. Add the sauce mixture and toss with the shrimp and rice to coat. Stir in the peas, carrots and egg and toss, cooking for another 1-2 minutes. Yum! Forget takeout! This looks delicious. And I love shrimp... perfect! I think it's difficult to get a nice photo of fried rice - although It is delicious, it just doesn't seem to be very photogenic, yours not only looks delicious it's a beautiful photograph also! Perfect timing! I couldn't think of what to make for dinner tonight for my teenagers (and ALL their friends). This would be perfect. Thank you! It looks good, however, Indonesian fried rice does not have peas and carrots in it, and the use of brown sugar for a "sauce" is not done either. Thanks Unknown for your comment! Although the recipe has been named 'Indonesian Fried Rice' by Cook's Illustrated where the original recipe if from, I know it certainly isn't authentic. I guess they wanted to replicate similar flavors for the regular American home cook. As I mentioned in my commentary, I prepared this recipe as a usual fried rice I've made, taking only the sauce used in the original recipe. I added peas and carrots for my own personal tastes... which I also noted in my commentary. So this certainly is not an authentic recipe for Indonesian Fried Rice as my commentary clearly notes. It was definitely good though! Although it isn't totally Indonesian, but it stands on its own...looks great and is tempting enough to try out! Thanks dear! I appreciate your spirit to learn and share innovative recipes like this! Just found this on FoodGawker, and I'm planning to make it tonight! Can't wait, thanks for the great idea!